Module permits text in a user-defined text-box to be inserted directly over 24-bit RGB video. Simply write the ASCII characters to be displayed to an internal buffer and the text appears as a video overlay. Features 3 font sizes, user-defined character bitmaps, text highlighting, 8-bit transparency, programmable colours, movable text-box, simple animation. 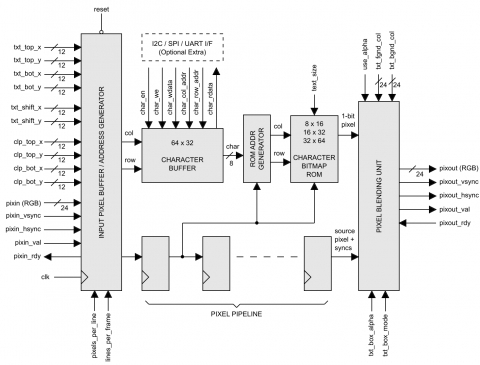 Easy uP interfacing with I2C, SPI or UART options.